Phase 1 of Straw Bale Gardening…. After much research, I am about to embark on gardening IN straw bales. One important step I’ve come to learn is that it’s best NOT to take shortcuts. Several people shared failure tales… simply soaking their bales with water for a few days before planting offered little nutrients to their plants and thus… little if nothing to harvest… they didn’t take the time to create a growing environment within the bale by adding the Ammonium Nitrate or compost teas to the bales for 10 days before planting. To be perfectly honest, I won’t be adding Ammonium Nitrate either… I can’t find the stuff! So, instead of using the 30-0-0 power of Ammonium Nitrate… I’ll be using the 21-0-0 power of Ammonium Sulfate. I’m hoping it will produce the same result, which is to begin to ‘cook’ or ‘compost’ the bale. This allows the bale to ‘cook’ – or increase the temperature of the bale as it begins the process of decomposing. We definitely don’t want this process to begin once our plants are rooting in the bale. Temperatures during this process can hit 165 degrees and will damage, if not kill, your young little starters. I’ll be taking pictures this weekend as I lay out the garden of bales, sprinkle on the 1st cup of fertilizer and then soak with water. From what I’ve read, the first day we will sprinkle 1 cup of Ammonium Sulfate onto each bale… the next 9 days call for 1/4 cup each day before soaking. I also plan on taking beginning temperatures and keeping a log for the entire 10 days to see what kind of temperatures we obtain using the Sulfate as opposed to the Nitrate. Stay tuned for more updates on the new garden! 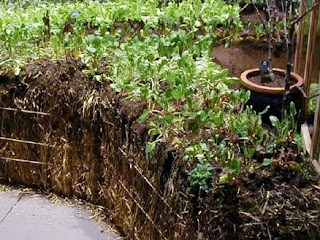 This entry was posted in Gardening, Straw Bale Gardening on May 5, 2010 by Homesteader's Supply. Q&A: Why did my milk not form cheese curds? How the Bottles you use for your Kombucha can affect the Fizz! We Won a Top 100 Homesteading Blog Award!